Today’s Sighting: You or your harvest workers may be seeing the the Fall Webworm, (Lepidoptera: Erebidae) Hyphantria cunea Drury, in your orchard this season. As this insect does not feed on fruit, management in commercial blocks may not be warranted. Remove the infested limbs to maintain esthetics in pick your-own-blocks. The Fall Webworm is a widespread native defoliator throughout the continental US as well as southern Canada and northern Mexico. This insect has two broods in some areas of New York State. The first brood occurs in May with the second brood, much larger then the first, occurring during July and August as we near harvest. Larvae have been recorded from >400 species of forest, shade and fruit trees, primarily hardwoods, but also several conifer species in the southern United States. Biology: The female adult is pure white and the larvae are black-headed in northern regions such as New York, whereas spotted adults and red-headed larvae predominate in southern regions. The adult female can deposit up to 1,500 eggs in a single mass, lain on the underside of the host plant foliage leaf. The female will then cover the eggs with bristles from the underside of her abdomen for protection of the cluster. Shortly after hatch, larvae begin building a web to enclose a few leaves at the growing tip of the limb. As they grow, they expand the web down the limb, covering more foliage and consuming more leaves. 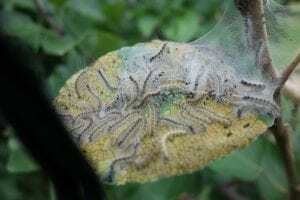 The larvae move from the web during their last instar stage, descend down the tree trunk or spin down, and pupate in a thin cocoon spun in the debris at or just below the soil surface. 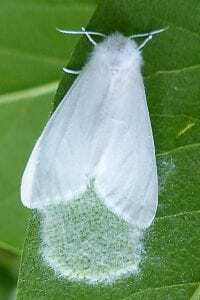 The larvae of the fall webworm feed on more than 100 species of fruit, shade, and forest trees. They are especially noticeable during late summer and early fall. 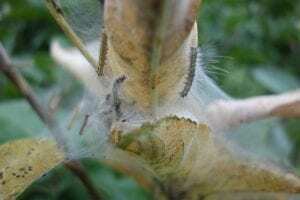 The larvae spin conspicuous webs enclosing entire branches or groups of branches. The webs are more numerous in open locations, such as along roadsides.Larvae feed inside the webs, stripping the leaves with just the mid-vein remaining. Damage is usually not severe, as fall webworms are seldom numerous enough to cause total defoliation. 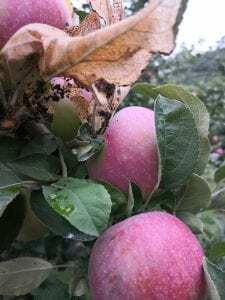 In late varieties such as Fuji and Pink Lady, management may be warranted to produce the needed carbohydrates to finish fruit sugar development. Biological Control: Populations of fall webworm are regulated naturally in its native range by host quality and abundance and by at least 50 species of dipteran and hymenopteran parasitoids and 36 species of predators and parasites.